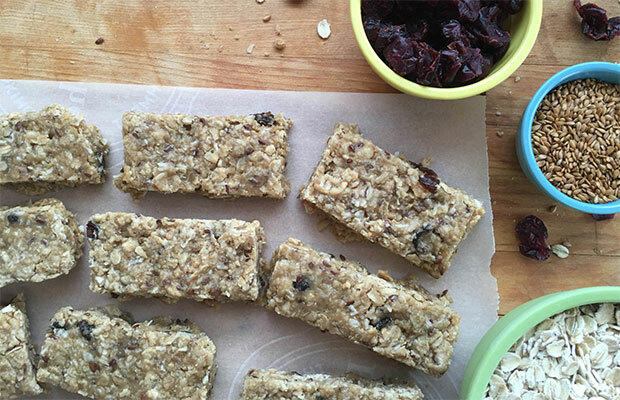 made with cereal, oat flakes, oats, raisins, whole flaxseed and sunflower seeds. 1/2 cup (125 mL) coconut, chopped nuts, cranraisins, etc. Spray 9 x 13 inch (22 x 34 cm) pan with nonstick cooking spray. Preheat oven to 350°F (180°C). In a bowl, cream together brown sugar, butter, granulated sugar and vanilla. Continue beating, adding one egg at a time. Add flour and ground flaxseed. Stir until well combined. Add cereal, oat flakes, oats, raisin combination, whole flaxseed and sunflower seeds. Stir until uniform in texture. Turn into pan. Bake 13 to 15 minutes. Remove from oven and cool on rack. Serving Size: 1 - 3.75 x 7 cm (1 ½ x 2 ½ inch) bar. Each serving contains 1 tsp (5 mL) of flax.